Many people from many nations were employed by the sugar plantations of Hawaii. The different languages and unusual names created problems for plantation management. Because of this, sugar plantation owners devised an identification system to keep workers sorted out. It was called the Bango Number System. 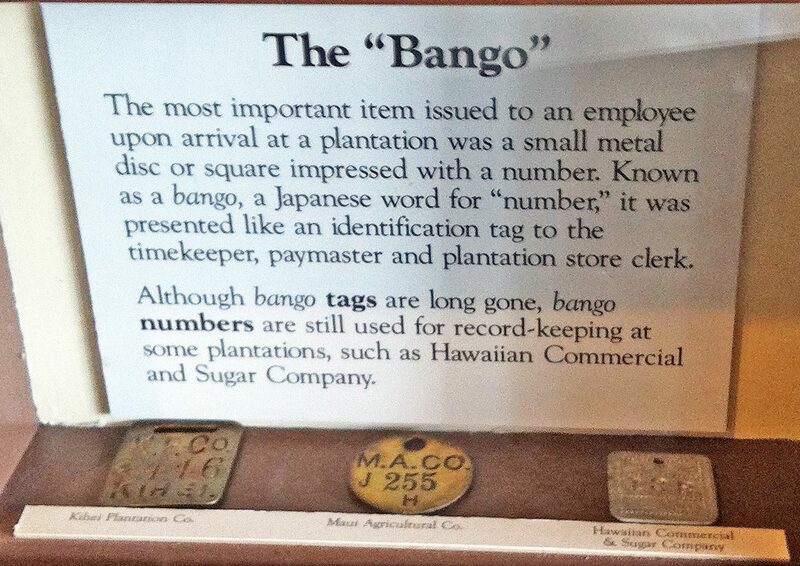 Upon each laborer’s arrival, a plantation official gave them a metal tag called a bango. The bango was made of brass or aluminum and had a number printed on one side. It was usually worn on a chain around their neck. These ID tags came in different shapes. The shape you wore was determined by your race. Every Hawaiian plantation used the bango system. Laborers were required to wear their ID tag during working hours. Plantation accounts were kept by bango number not employee name. Pay, deductions for infractions, store purchases, laundry services, and so forth were all kept in account books under the bango number system. On pay day, workers presented their tag at the payroll desk, and then, they got their wages. They could not get paid without their bango. Simplification of Bookkeeping or Denigration of Employees? Plantation owners claimed the bango number made life easier. It was difficult for the plantation officials to learn the various spellings involved in the names of laborers from so many countries. It saved them time and confusion. In practice, on the plantation, the bango became another way for one group of people to belittle another. Some overseers and Lunas would refer to the laborers by bango number rather than by name. By refusing to use an individual’s first name, it made it easier to treat them punitively. This created tension on the plantation. Management saw laborers as a sub-class and some laborers felt their identity had been stripped from them. The bango may have solved some problems for the plantation owners. By using a number rather than name system for accounts, they could easily look things up. As researchers, we know how mangled foreign names get when recorded by someone not familiar with them. However, the system made it too easy for management to look down upon the laboring class. By referring to employees by number rather than name, they added to the animosity that already existed between the overseers and lunas and the workers. The system was too easy to misuse by those who wanted to feel superior. Pau Hana by Ronald Takaki has a lot of information on Hawaii’s sugar plantation system. I consider it the best source for learning about this particular aspect of Hawaii’s history. Do You Have Your Ancestor’s Bango Tag? You are pretty lucky if you have your ancestor’s bango tag. It’s a little piece of Hawaii’s history and a remembrance of your ancestor’s story. Like the sugar plantation contracts our ancestors were issued in their homeland, I do not think many bango tags have survived. In all my years of research, I’ve only met two people who have their ancestor’s bango tag. If you have one, preserve it! And, know that tag is a symbol of the hard work that was done to create King Sugar in Hawaii.